This was definitely mop-up, sop-up weekend in the Premiership. At least, that's how a pair of the big brands treated it. 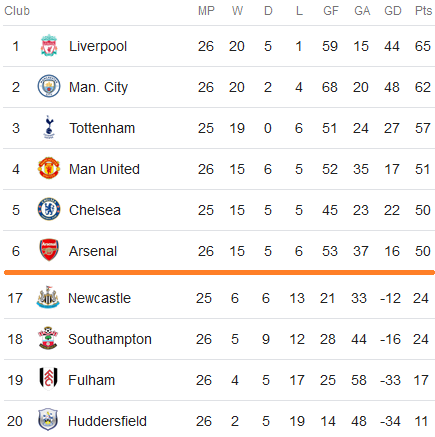 While Arsenal was inching into the race for Euro-qualification next season by toying with bottom-feeder Huddersfield, Manchester United did the smackdown thing on relegation candidate Fulham. The Red Devils entered the Top Four, thanks to a Paul Pogba double and a superb goal from Anthony Martial as United blanked the Cottagers, 0-3. As the match began and knowing full well their dire situation in the standings, Fulham started on fire and created a couple of good opportunities through André Schürrle and Luciano Vietto. However, French international -- and José Mourinho nemesis -- Pogba stepped up once again. Thenm in the 23rd, Martial presented a true masterpiece. That's why fans buy tickets and tune in worldwide. Excellence is fun to watch. United wrapped everything up in the 65th when Maxime Le Marchand fouled Juan Mata inside the area. Ole Gunnar Solskjaer has now gone 11 matches unbeaten as the interim manager. United's still addicted to finding a big name, but the Norwegian caretaker has done well to make his old club relevant for the second half of this season. The Cottagers, on the other hand, need to make up more than two games to even think about getting another season of Premiership goodies.